Whether it's goodbye at the door in the morning, or a final goodbye, these are times where ritual and tradition connect us as a family and as a people of God. Come up with your family's special way of saying goodbye in the morning before going off to work or school. Try this one-- "Remember WHO you are and WHOSE you are. 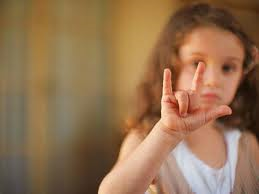 For the child is "too old" for a kiss at the bus stop, try using the American Sign Language "I love you"
If you’re feeling sad because your pet has died, these activities can help.